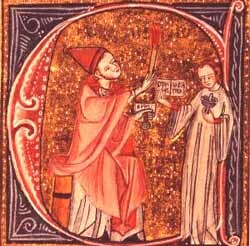 St. Gregory VII (c. 1020-1085) was without doubt the Pope par excellence of the History of the Church. Indomitable fighter against the Eastern Schism, the heresies, the revolted Empire and a usurper anti-Pope, he was also the inspirer of the Crusades that freed the Holy Sepulcher of Our Lord. Even though he was such a giant in the defense of the Church, he did not neglect the humble. His quick eye discerned every Catholic, how humble soever his station, who had suffered persecution for the cause of Holy Church. He honored and loved him far more than he would the bravest soldier who fought for earthly glory and won it at the risk of his life. “If we venerate the memory of those Saints who died after their limbs had been severed by the sword; if we celebrate the sufferings of those whom neither the sword nor torture could separate from the faith of Church, then you – who have had your nose and ears cut off for His Name - you deserve still greater praise. For you have merited a grace which, if accompanied by your perseverance, gives you a perfect resemblance to the Saints. “Your body is no longer perfect in all its parts, but the interior man, who is renewed from day to day, is now grander than ever. “Your outward face is maimed and, therefore, disfigured. But the image of God, which consists in the shine of virtue, has become more brilliant by your wounds, and its beauty heightened by the deformity which men have brought on your features. Does not the Church, speaking of herself, say: 'I am black, o ye daughters of Jerusalem' (Cant 1:4). If, then, your interior beauty has not been impaired by these cruel mutilations, neither has your priestly character, which manifests itself rather by the perfection of virtue than by that of the body. “Did not the Emperor Constantine show his veneration for a Bishop who had had one of his eyes pulled out? Was he not seen to kiss the wound? Have we not the examples of the Fathers and the early History of the Church telling us that the martyrs were allowed to continue the exercise of the sacred ministry even after their limbs had been mutilated? “You, then, martyr of Christ! Confide in the Lord without reserve! Congratulate yourself on having made an advance in your priesthood. It was conferred upon you by the holy oil; now you have sealed it with your own blood. “The more your body has lost, the more must you preach what is good and sow that word which produces a hundredfold. 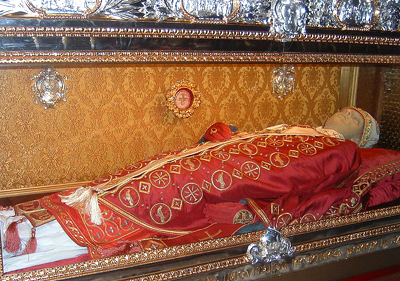 Such was Gregory, who preserved the simplicity of the monk and paternity of a father amid all his occupations as Pope.